That’s right, it is PM’s first-ever salute to the firemen and women who risk life and limb every time they are called out. Of course, we don't attempt to show all the fire toys ever made; too many manufacturers have honored fire fighters with great collectibles. But we have an exquisite Marx offering and it has perhaps one of the all – time rarest Marx accessories in it. So rare, most collectors (and I mean a high percentage of us!) do not even know it exists. Who among us at the sirens roar, doesn’t look up; whose strong heart doesn’t race at news of the rescue of a family, baby or even a pet from a fire? Kath and I figure it’s time for engines, ladder trucks and the men who man them to shine bright here on the pages of PM! 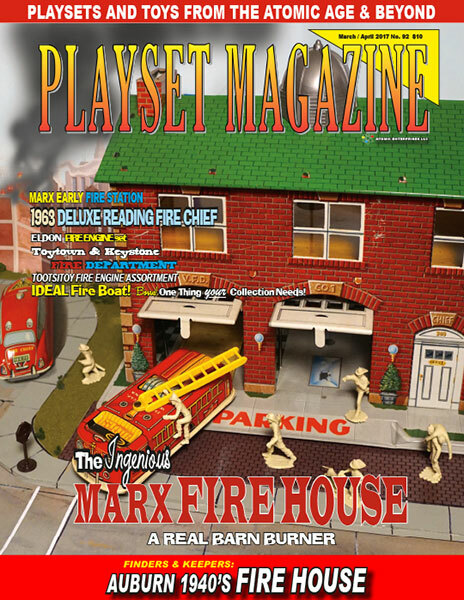 The Marx set featured this issue is a dead mint Marx Fire House playset, an early set from the early 1950s and one of the earliest I think we’;ve ever covered in depth. We were all transfixed at the color, the detail and loving design lavished by the Marx designers when putting this set together, and I’d have a hard time calling on a more charming peacetime playset to enjoy on these pages. And it’s a real wonder, too, as it has never been featured in such detail, with many pages of color photography and text, marking the world debut for possibly one of the rarest of all Marx accessories intact. You’ll see what that is as Rick Eber presents this scarce Marx Fire House for young Chiefs to admire and enjoy. 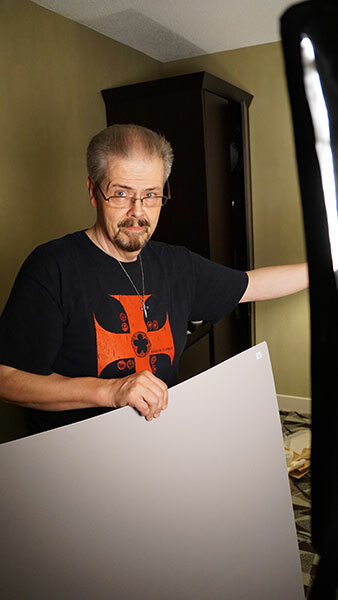 We also want to say thanks to those who helped during a marathon photography session on this set: Craig Remington, Key Grip Tom Lowzowski, and Bob Jones foremost among those who hung in there to build the set and get ‘er photographed. Of course, one could not say enough about Rick for bringing such a rare set to our “Chicago Studios” of OTSN to share. Thanks to all! I also want to shout out thanks to those great firemen PMers who have smoothed the way for us during these past several years, friends and collectors who also spent their youth battling blazes, thrown bottles and rocks, and riding the fast ride to a burning hell. Thanks to fireman Johnny Pinkowski of Connecticut (a long-time ace collector), chief Larry McCown and several others, you know who you are. Thanks. We also have a never-before shown Deluxe Reading Chief display to take your breath away, but hopefully not for too long. 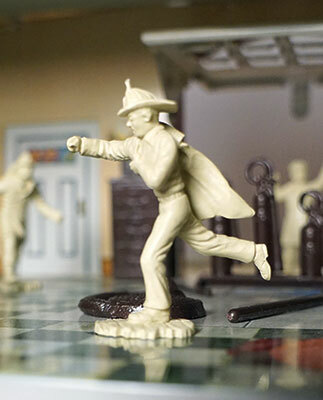 You’ll resuscitate with other fire departments this issue as well -- Tootsietoy’s long history of packaging figures, vehicles and sometimes buildings into great looking sets qualified it for inclusion. Plus we have Auburn’s awesome late 40’s VFD, plus Eldon, Keystone, Wyandotte and more! Something New – Auto renew! OK, we’re on the bandwagon. Auto-renewal is now a real thing here at PM, just tell us you want it and your subscriptions will automatically renew, no muss no fuss. Just call the office with your choice of credit cards (except American Express). This is a free service and replaces the old “two year” check-box that was on page 4 (opposite). And its sort of a big move forward for us, technologically. It’s all inspired by one of our collectors whose total collection -- in a very non-amusing event -- was destroyed and even his story is included, complete with a great lesson for all. Finally, we thank all those holiday well-wishers who sent in cards just a great shoulder hug of thanks. Photos of your families and images of the peaceful time surrounding Christmas were very much appreciated.